This knife has everything a real bushcraft enthusiast needs, well-packaged and ready for sudden challenges. 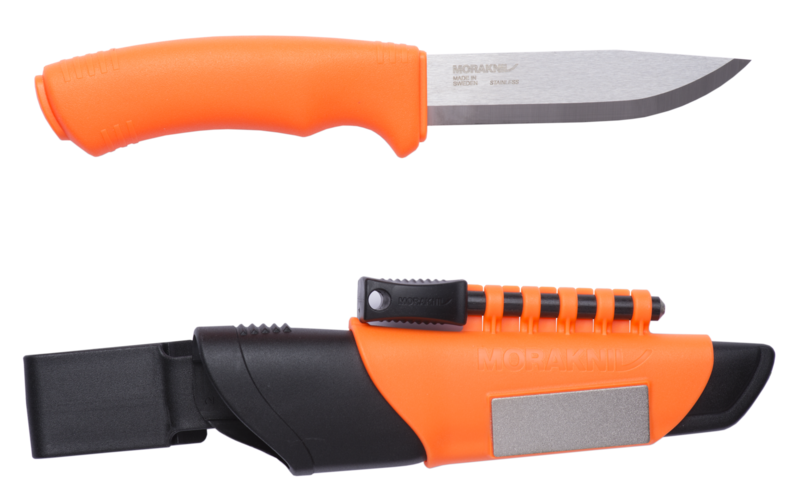 It’s a heavy-duty, sturdy knife, with a sheath that comes with an integrated fire starter and a diamond sharpener, making it the ultimate survival knife. A sharp blade with a defined tip, integrated fire starter, and diamond sharpener make Bushcraft Survival the ultimate bushcraft knife. The 3.2 mm thick blade in stainless steel and has a spine that has been specially ground so that it can be used with the fire starter. The knife’s fluorescent orange color makes it very visible so that you don’t have to search around for it.